So you’ve seen the hype all over every single tech website. Samsung is teasing everyone with the next Galaxy release. If you haven’t already you can view their teaser video which consistently shows the number 5 leaving people to speculate that their next device will be the Galaxy S5. We only have a day left so I thought I would keep the teasing going by leaving their video here. As seen on 9to5Google, Google will be announcing a smart watch next month manufactured by LG whom they have had successful partnerships with the Nexus 4 and Nexus 5 smartphone. Google will be behind the design software and hardware of the product. With Google announcing the product in the month of March, it will not be released until June at Google’s I/O Developer Conference. The smart watch’s operating system will revolve around Google Now’s voice assistant and search feature. This will have a major role with how users interact with the watch. Each year Google proves that its more then a search company but a tech power house. I have mixed feelings about this. I recently downloaded Flappy Bird and made a high score of 21. Now the developer of Flappy Bird Dong Nguyen says “that he cannot take this anymore”. I guess the hype of the game got to him. He will be removing the game in 20 hours, at noon est. Flappy Bird has been a very successful game in both the Google Play Store and iOS App Store. Earlier this week it was announced that the developer was making over $50,000 per day just from Ads. That’s a lot considering the simplicity of the game. What are you’re thoughts on the games removal? Leave your comments in the box down below! All white Limited Edition OUYA with 16GB of Storage for just $130! For most, the original OUYA with 8 GB of storage is working just fine for them, but for others, it just isn’t enough. 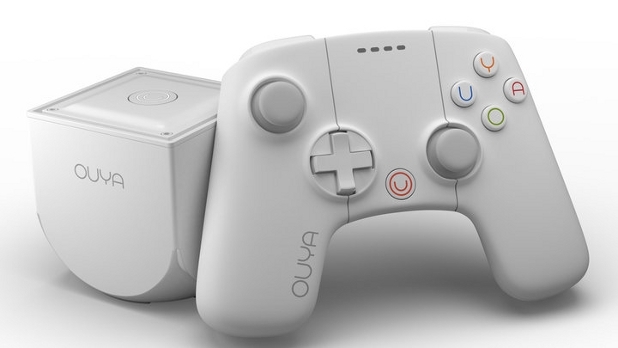 Luckily the makers of the OUYA is now offering an official 16GB all white OUYA for just $130. Now if you are willing to pay an extra $30 for 8GB of storage and a different color than go right ahead. If not, or 16GB still isn’t enough for you, then you’re in luck. The Makers of the OUYA are promising a software upgrade that will allow for USB support. I have no idea how apps and games would install, but it is definitely better than having just what’s inside the box. I have a question for you, do you think this is enough to get more people to buy this Android powered having system? Tell us what you think. Posted on 11/18/2013 11/18/2013 Author oFalcoCategories Android, GamesTags 16GB, OUYA, WhiteLeave a comment on All white Limited Edition OUYA with 16GB of Storage for just $130!